When I was a teenager, I almost always had my hair in a French braid. It was easy, and it kept my hair out of my face. I don't see many French braids anymore, but these braids are a great way to style your hair. They look like you spent a long time on your hair or visited the salon, but they are all easy enough to do at home with some practice. 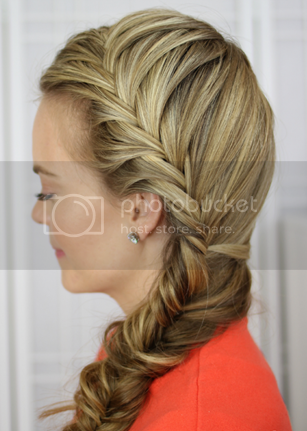 Also called a Dutch Braid, this look works great on both thin and thick hair. Of course, your hair needs to be long for this look. Start the braid by parting your hair off center. Then take a section of hair on the larger side and divide that in to two halves. Take a small piece from the edge of the right side and cross it over the top and add it to the left. Repeat braiding, but add strands of hair from each side of your head. Repeat until you get to the top of your ear. Now start pulling hair from the opposite side of your head and stretch it around the back of your head and add it to the braid. When all of your hair is in the braid, finish the braid with a fishtail braid. Pull on the edges to loosen it. Start with slightly damp hair and part it on the right side. Take a two inch section of hair from the front of your hair just to the right of your hairline and start a French braid. 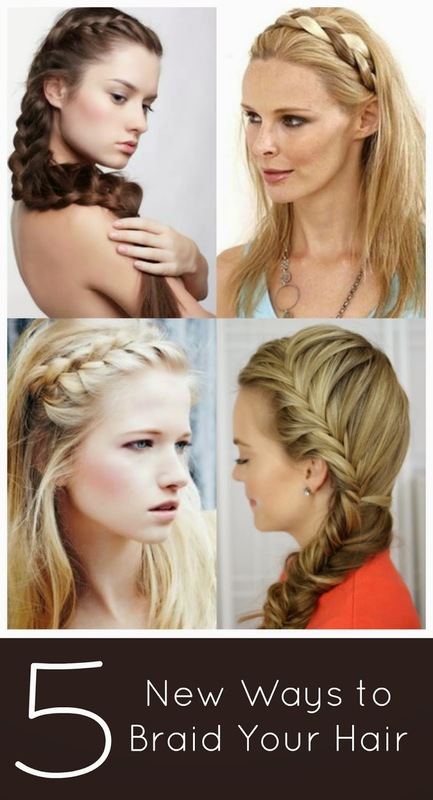 Keep adding more hair as you repeat the braid. Continue braiding until you are an inch away from your neckline. Now braid horizontally to the left neckline. Keep the braid tight so you can control it better. You should have all of your hair in the braid when you hit the bottom of your left ear. Finish the braid and use a hair band to secure. Part your hair just off center on the right side. Continue the part to the top of your hair. Part your hair down to the ear and use a pony tail holder to secure the hair hanging down. On the left side of your hair at the top, start your braid. Continue French braiding, adding hair from the top of your head. Once you run out of hair to add, keep braiding to the end of your hair and add a clip to secure it temporarily. Move the braid aside and smooth your remaining hair to the left side of your head. Secure loose hair in a low side ponytail. Wrap your braid under your ponytail and wrap it around starting at the bottom. Use a rubber band style pony tail holder to hold the braid in place. 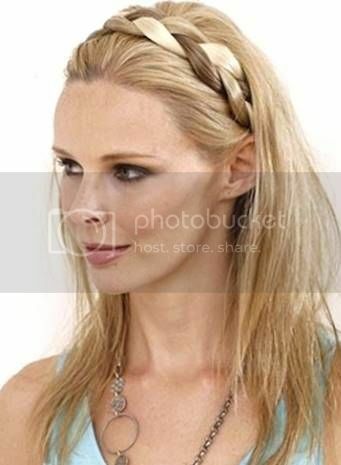 Unbraid loose hair below the pony tail holder. Make a part on each side of your head near the ear. Comb the rest of your hair back in to a ponytail. Take the right side of your hair and braid it towards the other side of your head. Use a ponytail holder to secure the braid. Lift both braids and wrap them around your head towards the front. Use bobby pins to secure both braids. Take out the ponytail holder securing the back of your hair. Take a 2-inch section of hair from behind your right ear. Secure the rest of your hair with a hair tie to keep it out of the way. Comb the loose hair over the top of your head. Use a blow dryer and hair spray if needed so the hair will go that way easier. Divide that section of hair in to 3 pieces and braid in a simple braid. Braid up your head towards your other ear. You want the braid about 1 to 1.5 inches from your hairline. When you reach the left ear, use a bobby pin or hair tie to secure your hair. If you want, use bobby pins to tuck loose hair around the braid. Spray with hairspray and take out the hair tie holding the back of your hair out of the way. Thanks to Miami based Master Stylist Raphael Reboh, owner of Femme Coiffure Salon for providing the images and instructions for today's post! Have you ever tried one of these braids?